Led by Diana Gilon at Harvard University, Acrylic on canvas 60" x 72"
This project began with a variety of student volunteers from different faiths who wanted to celebrate the religious diversity on their campus through art. Participants were asked to upload images and inspiration related to their identity, faith and culture to a public shared account. 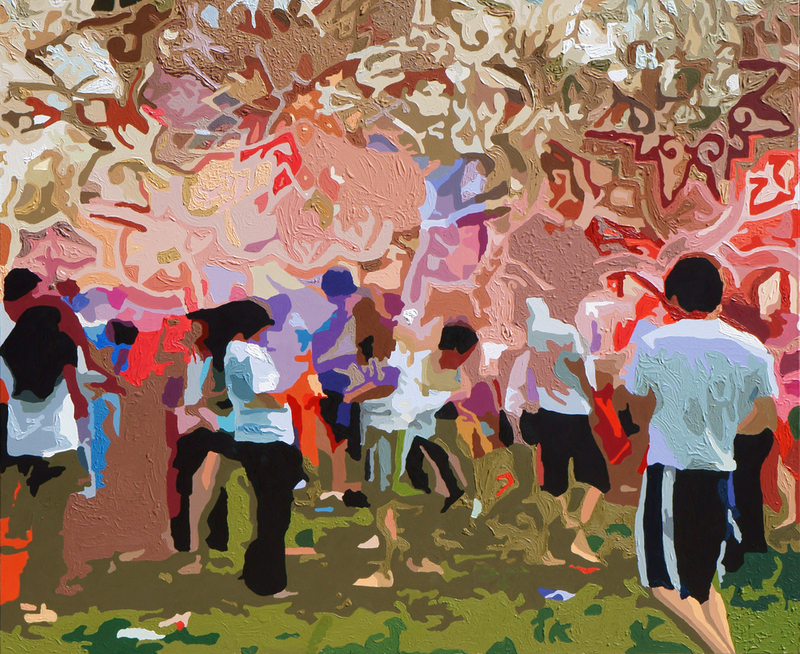 The group brainstormed via Skype, looking at each others uploads, and chose to use imagery from the Harvard event, “Holi” as the base of the painting. The image was chosen because the group felt it was a personal example of a successful Interfaith and Intercultural event at Harvard. Although the event is a Hindu tradition, students from a variety of backgrounds participated and took ownership for it. It was meaningful to the participants because they were happy to learn about it and share in this beautiful tradition with their community. For the first half of the project, the artwork was created publicly on the steps of the porch of the famous Memorial Church, on Harvard Yard. During the second half of the project the weather forced students inside and the project was created publicly at Harvard Hillel. Passersby who were not involved in the initial planning of the project painted as well and students from a variety of faiths and cultural backgrounds visited both project sites to get involved.